The traditional Asian diet is comprised mostly of legumes, cereal grains, fruits and vegetables, and is generally quite low in fat. The Asian dietary pattern also includes a wealth of fermented soy foods, as well as anti-inflammatory spices such as curcumin, cinnamon, ginger, and garlic. The Western diet is the nutritional opposite in many respects, containing much lower amounts of plant foods; on the whole, this diet is high in fat and low in fiber and complex carbohydrates. It's important to recognize that soy is a dietary staple in Asian diets. And yet, some soy critics contend that soybeans, as provided by nature, are not suitable for human consumption. These same critics concede that, after soy undergoes proper fermentation and extensive processing, it becomes far more digestible and moreover healthful. Beneficial bacteria used in fermentation yield healthy cell wall contents and metabolites that promote optimal immune function and intestinal health. The fermentation of soy improves the digestibility of the soy protein. Moreover, the bioavailability of soy isoflavones is enhanced by the bacteria in the small intestine due to its conversion to more readily absorbed forms. Leading nutrition experts recommend around 35 to 40 grams of fermented or cultured soy protein a day, which is the average amount of soy consumed by individuals in Taiwan and Japan. Again, this is mainly in the form of fermented soy foods, augmented with fish, poultry, rice and vegetables. Fermented soy foods include miso, tempeh, fermented tofu, nattokinase, and shoyu. Soy products are low in saturated fats and cholesterol, and there is some evidence that regular consumption of these foods helps lower the risk of heart disease, and osteoporosis. Nevertheless, some types of soy are indeed off limits. One of these is soybean oil because it is high in polyunsaturated fat. Also soy sauce, which is very high in sodium, should only be consumed in small amounts. Texturized soy protein and other highly processed forms of soy should also be avoided, due to their potential to have adverse effects on human health. So What about Spices and their Role as Anti-inflammatory Agents? 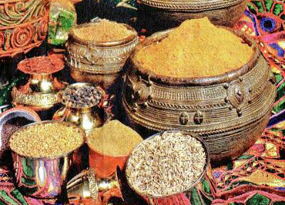 For many centuries, spices such as curcumin, which is the active ingredient in turmeric, have been used extensively in Indian cooking and in Aryuveda, the traditional Indian Medical system. Research has shown that curcumin has powerful antioxidant and anti-inflammatory properties. Currently, the National Institute of Health (NIH) has funded more than a dozen clinical trials showing the efficacy of curcumin as a chemopreventive agent for patients undergoing treatments, as well as for the management of Alzheimer's disease, osteoarthritis, and other chronic conditions.